Companies such as Xiaomi and Essential are making headlines these days with design work they’ve done to eliminate as much of a smartphone’s bezel as technically possible right now. But if we look back to 2014, it was the Sharp Aquos Crystal that likely started this trend. The device had virtually zero bezels on the left, right and top of the device. This left it to pack in much of the sensors (ambient, camera, etc) into the bottom bezel of the phone. Sharp devices aren’t that popular here in the United States, but the accomplishment in and of itself was enough to grab the attention of the Android community. In 2017, we’re seeing big OEMs like Samsung and LG pushing the bezels further than they ever have before, but they still aren’t doing what Sharp did back in 2014. In fact, Sharp even followed up the Aquos Crystal with the Aquos Zeta SH-03G in 2015 that improved upon the original design of the Aquos Crystal. Now we have the Xiaomi Mi Mix and the Essential Phone that has adopted many of the aspects of those two bezel-less phones. Sharp isn’t done though as they’ve just announced a new device called the Aquos S2. Some will immediately look at the top of the device with the curved cutout for the camera and think about the Essential Phone. It seems Sharp has decided to move the camera sensor up to the top again and has filled the space left in the bottom bezel with a fingerprint scanner. 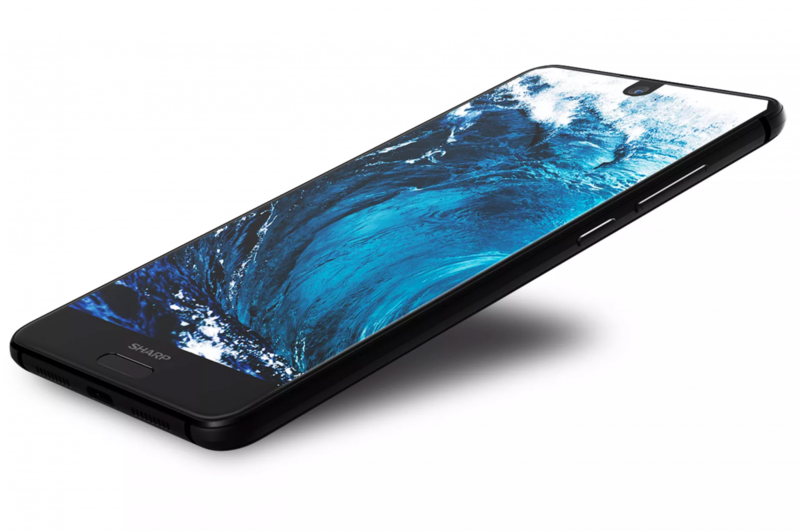 The Aquos S2 from Sharp has a 5.5″ 1080 x 2040 pixel display, Snapdragon 630 SoC, 4GB of RAM, 64GB of internal storage and a dual camera setup on the back (two f/1.75 lenses). There will be a premium version of the Sharp Aquos S2 though with 6GB of RAM and 128GB of internal storage. Both variants will have a 3,020mAh battery, launch with Android Nougat and are currently only on sale in China (prices starting at ¥2499, or about $373).